Observing the spasm in his right hand, he loosens his grip on the video remote control, clicks the mouse and then the trackpad. 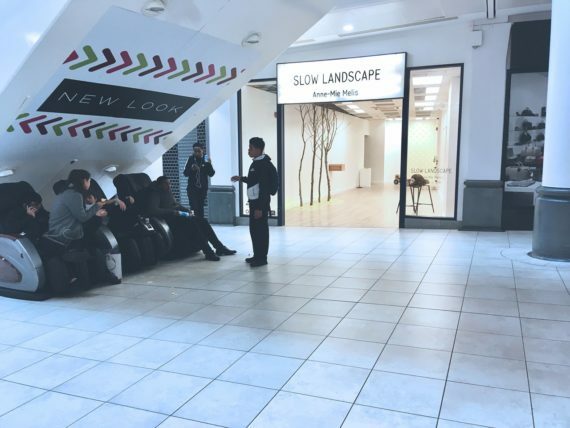 Browse, scroll, download, electrons fly, vast quantities of data cycle by and in 8K resolution – that’s 7,680 x 4,320 pixels, we zoom into focus: Queens Arcade Shopping Centre is the place to go. Depending on the connoisseurship of the consumer, QASC’s function as a micro knowledge-based economy, where one’s appreciation of taste, smell or texture, producers’ skills, geographic specificities, traditional knowledge, and heritage serve as the basis for creating added economic value. By implication, the taste and knowledge of skills are usually local in nature and are embedded in particular geographic locales and social circles…Ah It feels like only yesterday that it opened in all its perfection. QASC sprawling with humans, congested, full but then, an unexpected turn that enters a remote area where transactional services and relationships are more scarce. Now to the waiting room, if that’s what it is. Younger adult human specimens than I would have expected to come across. Young adult humans who seem to be massaged as they sit in large chairs, larger than normal, in this oversized waiting room. The chair and human merged, to benefit one another, although the longer the dance goes on, the more harm the chair seems to be under. A constellation of dots catches his eyes; yellow fluorescent or full of Riboflavin, now entering the artificial post-capitalist environment. His eyes blink at these dots, subjected to the intense light. Do the Trees grow? They seem to somehow. The branches thrust and poke through the rigid frame of the main beams. 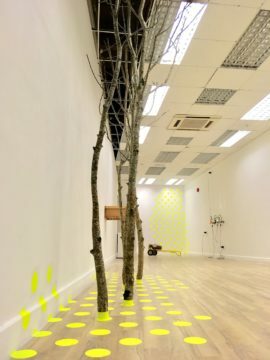 The trees arms enter, pushing out the ceiling tiles, introducing and extending their fixings into the space to improve health or increase productivity perhaps…beginning slowly to enter, interlock and merge themselves into the main frame of the QASC Arcade. A suspended future is visible, incubated in the trees, in manipulated circles – part transfer, part repair, maybe the constituents of living things create new and useful products, their purpose beyond our imaginations. Transforming whole industries, they have begun to be transmitted out of their ordered display, across the walls of the space, interfering with electrical sockets, reconditioning to weaken or to strengthen, currently we can not tell. This seemed to create new and useful products in QASC. Each time I returned humans, not always young adult humans, carried differently defined bags. An increased productivity was noticed as they skipped faster to avoid more stationary uniformed humans equipped with commands, tags and lecterns. The weighty fossil, felt local, this seemed important to some and much less if at all to others. 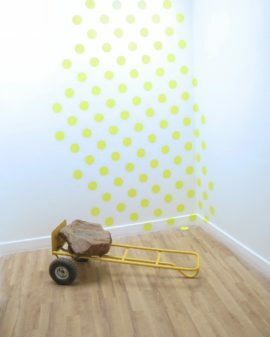 Bright yellow shines the two wheel truck with its conquest representing an imbalance between its work and what it calls its more spiritual intentions. Anne-Mie Melis is a Belgian artist, living and working in Pontypridd. 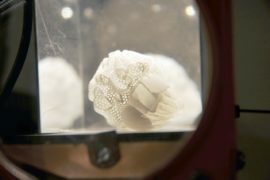 Her work is diverse, multi-disciplinary and has included droplets of tar black flowers intervening in the workings of a colliery, stop motion animations of future plant hybrids as well as photography, drawings, and sculptural installations. Throughout, Anne-Mie considers human impact, both political and ecological, past and present, on the natural environment. ArcadeCardiff is a contemporary art space in Queen Street Arcade Shopping Centre, Cardiff City Centre.